These are four of my dear friends. 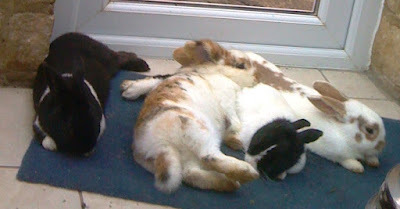 The second and fourth rabbits from R. are the mum and dad. The other two are the offspring. They get on well, and are very endearing, gentle, affectionate pets. They are indoor and outdoor pets, playful and frisky. When I work, I hear Roy’s fast, heavy footsteps; Jake, the Collie’s equally fast footsteps, which sometimes sound like Roy’s because he has 4 feet to Roy’s two; Irene’s light, fleet of foot, always running footsteps; and Zoe’s slower, more deliberate ones. And then rabbit footsteps, soft, gentle, like the wind, coming to visit me. They always make me happy. How sweet! I miss my rabbit, who is still in Atlanta because my landlord thought a rabbit would be too destructive in my rental condominium.